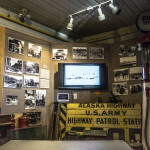 The Alaska Highway was built during World War II, more for US military purposes than for the general public, however the road was officially opened for public travel in 1948. Over the years the highway has slightly changed route and has been upgraded many times. 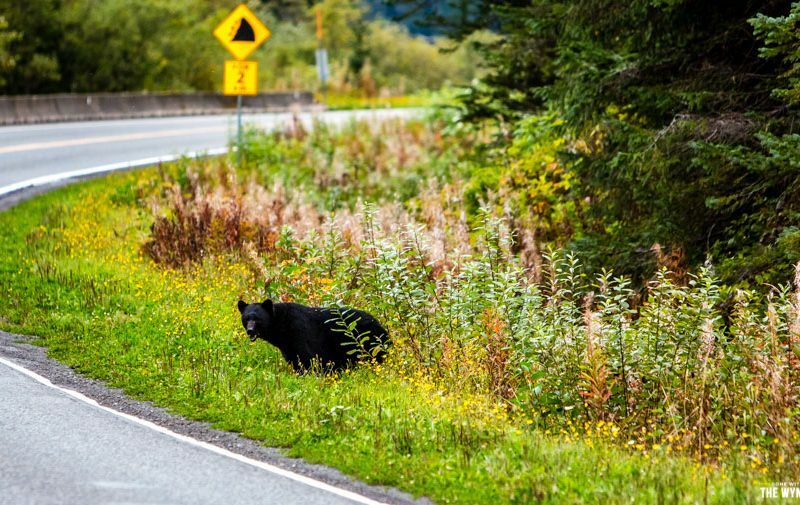 The road is commonly referred to as the “Alaska Highway” or the “ALCAN” since a great portion of the route is in Canada. Throughout our travels we’ve talked with many people who’ve warned us “the highway to Alaska is horrible, and it will destroy your RV” but we didn’t find that to be the case at all, at least this portion of the Alaska Highway is nicely paved and in good condition. 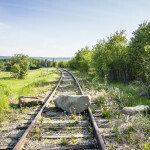 Here in part 1, we’ll cover our travel route and destinations from Dawson Creek to Fort Nelson, then stay tuned for more! The most exciting part of this route for us was also the most painful! Somewhere near Mile Marker 80, just north of Charlie Lake, we ended up on the receiving end of a rock being hurled from an oncoming logging truck. 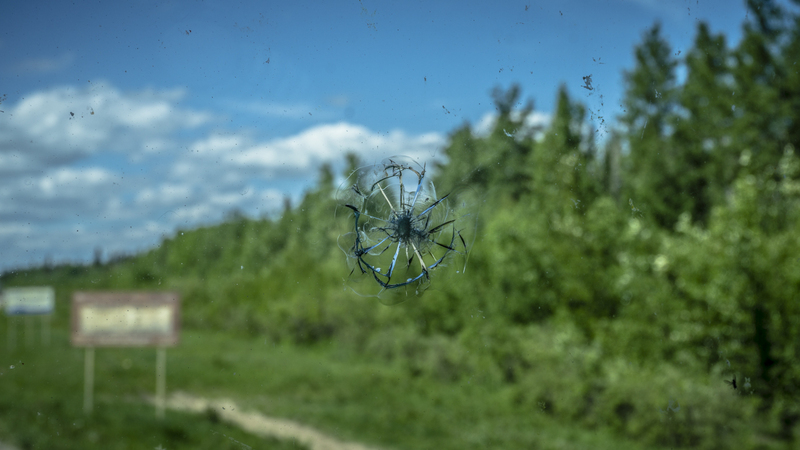 I knew a busted RV windshield was going to happen eventually, but we didn’t expect it so soon in the trip, especially since we’re not even to Alaska yet! It totally took us by surprise so we decided to shoot a video about it. Yes it’s a total bummer on our brand new rig but we just chalk it up as part of the adventure…right? 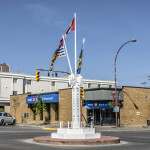 Dawson Creek, British Columbia, Canada marks the official beginning of the Alaska Highway. We’ve been told you MUST stop by the sign and the mile marker to take photos with it, kinda cheesy but when in Rome. 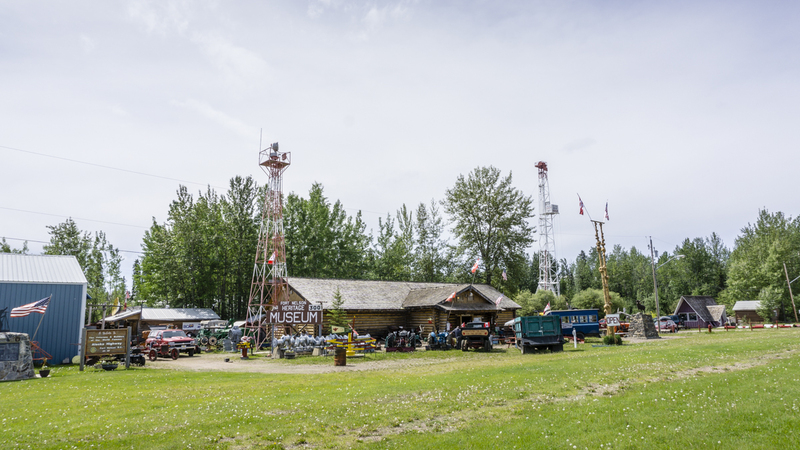 There’s also a small museum at the visitor center that’s worth a visit for a little history on the ALCAN and early life in the area. We’ve read this is a great place to stock up on necessities but honestly if you’re driving through Grande Prairie, AB do your errands there because the fuel is cheaper and there are more options for stores including a Costco, Home Depot, Best Buy and most everything else you’d expect to see in decent sized city in the lower 48. 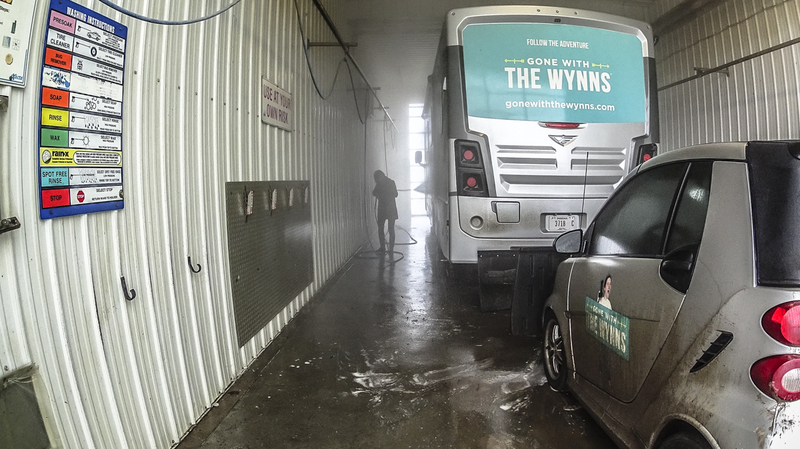 We were however in need of a solid RV and car wash and the enclosed bays at Tubby’s were a nice escape from the cold weather. At $1 per minute it took us a solid 48 minutes to get all the grime off both vehicles, ouch! A small hiking trail with views of a small body of water. There are loads of birds and water fowl and during our visit we found what we figured to be the world’s largest natural dandelion field (at least it’s the largest one we’ve ever seen). But oh wow…loads of mosquitoes here so make sure to pack on the deterrent and wear long pants and cover up all exposed skin, or just run the entire time like we did! 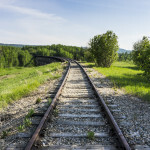 The Dawson Creek Visitor Center told us about an old trestle railroad bridge that is located in the nearby village of Pouce Coupe. However, we got the feeling this isn’t a friendly place to stop, Nikki compared it to a modern day ‘Deliverance’ experience with everyone staring at us and everything looking really run down. The local visitor center is closed down and overgrown. There are historic markers around town but many are located near a “locals only” sign or “area under video surveillance” signs. We didn’t feel safe leaving the car parked here so…I guess we’d say don’t visit this little place unless things change dramatically in the future. We stayed at Northern Lights RV Park and it was fine. The check-in lady was extremely helpful and friendly, but the major feature here is the “screamin fast” free WiFi. Our WiFi Ranger clocked the speeds at 9 mbps, typically I’m happy when I see 2-3 mbps, so we were able to get at ton of much needed work done. 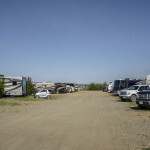 Most RVers roll in for one night, we stayed for two to catch up on laundry, chores and work. There are limited 50a hookups but there are plenty of 30a hookups which we opted for to save a few bucks per night. Our Hybrid inverter came in handy as we were able to power both computers, cook on the griddle, use the washing machine and run a space heater all at the same time! Typically our breaker would pop with just the griddle and space heater on, hooray for new technology! Tip – If you’re heading towards Alaska and need to fill up with gas or diesel do it BEFORE you get to the RV park. We didn’t realize Northern Lights RV park was on the outskirts of town and the nearest gas station was 5 km the wrong direction. 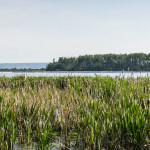 After our short stint in Dawson Creek and the commercial RV park we decide to skip the town of Fort St. John, BC altogether and head for the Provincial Park just north of town. Which turned out great! You see, we’re on this amazing road trip and we want to spend it with Mother Nature, not exploring some random town (we love small towns, but these were pretty basic and different strokes for different folks) or walking through a mish-mash museum of randomness. 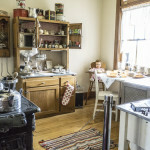 If we’re going to spend time in a town it has to be surrounded by nature or filled with craft offerings from passionate people (I’m talking unique art, breweries, coffee roasters, distilleries, farm to table eateries, and so on). 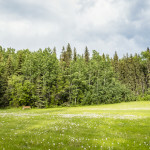 On the east side of Charlie Lake Beatton Provincial Park is a quiet campground used more by the locals than the typical Alaska Highway traveler. We found a nice little site with partial sun (for our solar) and a cut trail to the boat launch. 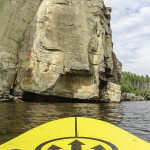 We spent the afternoon paddling our iSUP around the lake basking in the warm sun. There were only 3 other boats on the lake, the wind was fairly calm and the water was almost as flat as glass. We spotted several birds making mud nests in the rocks, a few big fish swimming below and a little head pop up out of the water just a few meters away! We’re guessing it was a river otter or maybe a beaver or something similar, but he swam much faster than we could paddle so we never got a good look (or photo). As the sun meandered its way toward the horizon we took Mr. Singa for a walk to stretch his legs and watch the clouds roll in. The only bummer here is we wish there was more time, we could have easily spent a few days lounging, shooting videos and paddling. 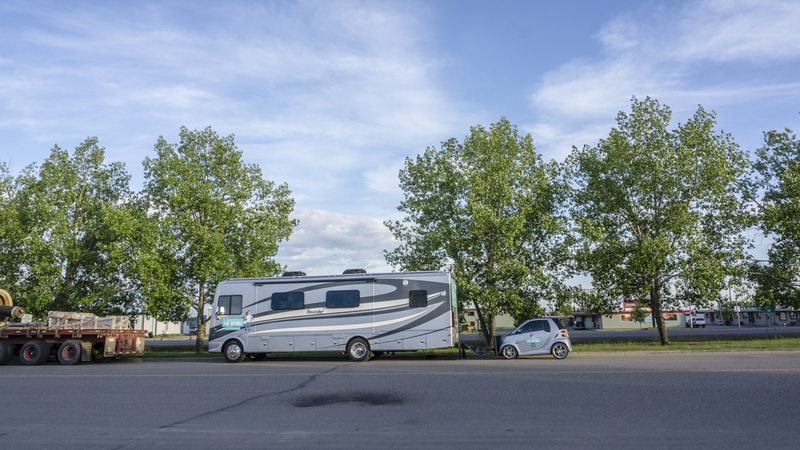 Tip – It’s really important to consider cost of fuel vs. number of nights stayed when traveling out of the way for a specific campground. We could have easily stayed in town for $30 but we wanted to be in the smaller campground for $12. This campground was 14 kilometers off route so considering the price of fuel we didn’t really save anything by visiting this less expensive park…however the clarity that comes with relaxing and being alone in nature makes up for it no problem. We had planned to stay for a couple nights, see the hoodoos at Lake Wokkpash and visit the museum. But with our newly busted windshield, we weren’t sure what was to happen next. Here’s how it ended up: We fill up with fuel because this is as cheap as it’s gonna get for several hundred Kilometers. We drive to the one campground (the Triple G Hideaway) on the edge of town. We decide the campground isn’t gonna work because their WiFi was down and the price was too steep. Instead we decide to park on the highway axis road based on info from our gas station attendant. We found some random public WiFi to tap into, and after checking emails and such for any major work related fires, we decided to call it a night (yes, this is what nine o’clock at night looks like here). We drove by the Ft. Nelson Heritage Museum but it was a little too “eclectic” for our taste, and we didn’t have any more Canadian money to pay the entrance fee. 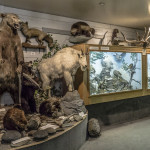 Across the street from the museum is the Northern Rockies Visitor Information Center and the people there are extremely knowledgeable about the area and the Route to Alaska. They offered up recommendations for several hikes on our route that they claimed are “must stops”: Tetsa #1 Trail, Summit Peak Trail and Mineral Licks Trail. Inside the visitor center is fast free WiFi, and free coffee, there’s even a free dump station & freshwater fill on the property. Now that is a giant RV friendly welcome! Its good to know they do not allow overnight parking and they have YouTube and other video sites blocked because they don’t have unlimited internet. It was hard for us to get away from the visitor center because it’s the last WiFi we’re likely to get for a while, but it’s time to hit the road and get in some good hiking! Tip – If you have a few extra days the hoodoos at Wokkpash Creek seems pretty darn cool! It’s a 4WD and multi-day back-country hiking experience, not the best when you have a big RV and pets to look after, but could be worth the effort. 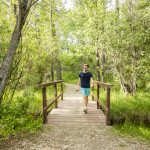 Stone Mountain Provincial Park offers camping and shorter hikes to hoodoos but nowhere near the same quality hoodoo as the Wokkpash Creek Recreation Area. Fuel Prices – Gas and Diesel were both more expensive up here, but what do you expect? Dawson Creek was the least expensive sitting around $1.15/liter and Fort Nelson was the most expensive at $1.43/liter. Road Conditions – The roads are mostly paved with little damage along the route. We did encounter a few construction areas where there was gravel and/or dirt stretches of road but it was maintained and not all washed out. 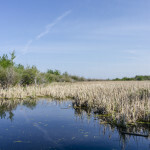 Have you traveled the ALCAN? What was your take on the route, the towns and the road conditions? 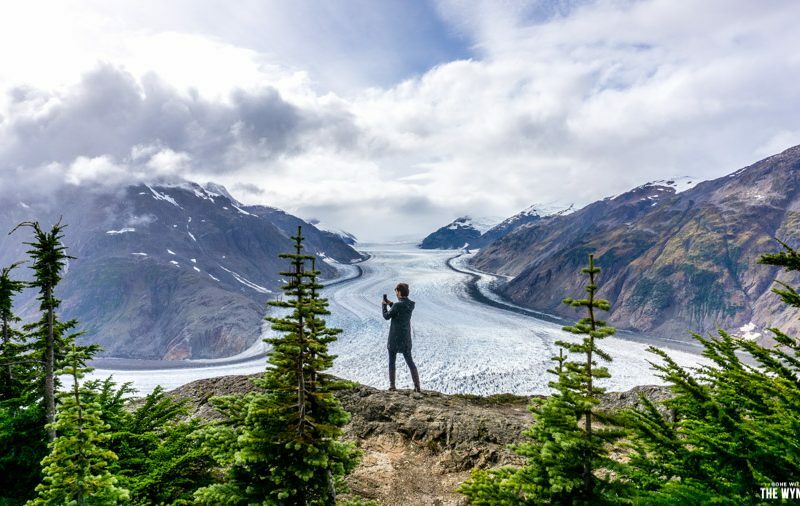 Please share your thoughts and tips in the comments below to help other travelers planning their #AlaskaBound adventures. Coincidentally we got our only rock in the windshield on our first Alaskan adventure pretty near where you got yours, you used to be able to get some pretty good pies both at the Shepards Inn at Mile 73, and Mae’s Kitchen at about Mile 145 as well. 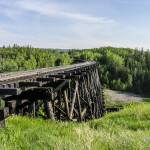 I did the big trip in 92 on the anniversary of the building of the hwy, drove up to Fort St. John to hook up with a friend and his family, then off we went, went into Dawson City then took the top of the world hwy and saw lots of scenery, then onto Tok and eventually to Fairbanks Alaska. Hope to do it again in the next year or so, only now with a family, I am 60 now and have a learning disability daughter, but think she would like it too. It’s hard to beat Alaska, in fact we keep thinking about our sailing adventures and wondering if we’ll ever see anything as amazing as that trip. Have fun out there. What software and hardware do you use to create and publish your blog? We just started from Dawson Creek today. Free wifi and the wifi ranger are the way to go. We are finding that expanding 4GLTE in lower 48 is really cutting into availability of free wifi. 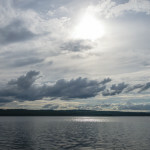 While transiting Canada what did you do for cell service? I’m assuming you have a US cellular plan. 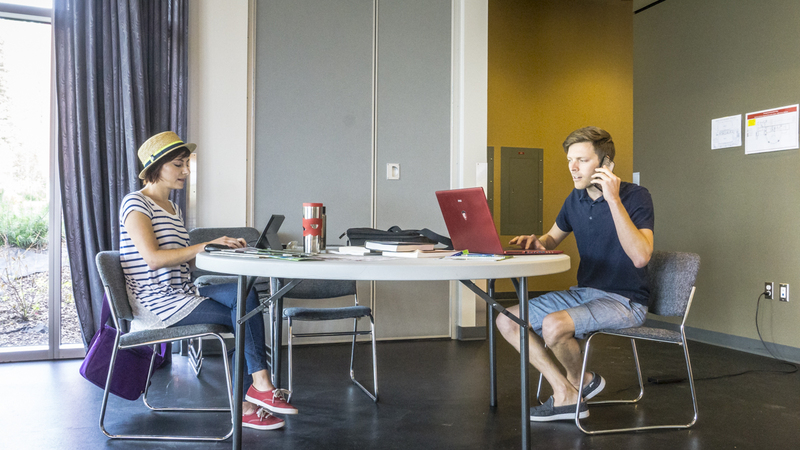 What provisions did you find effective for cell service in Canada? Also wondering if you have an unlimited data plan so you can stream audio and video programming and how that worked in Canada? I live in WA state but I grew up in Dawson Creek. Great people there! Just wondering how far is it between Diesel stations on the highway since I have only a 26 gallon tank in my RV and I might have to carry extra “Jerry Cans?” Thanks. Pick up a copy of the “Milepost”-everything you want to know! Amazon carries it or your bookstore can order it. A couple of friends & myself are flying into Anchorage from Austalia at the end of August, we plan on hiring an RV camper & spending 8 days touring around before boarding a cruise. Reading your page has been fantastic & I can’t wait to read more of your adventures. Thanks for sharing. ha ha, that’s awesome. I would love to see that photo! You two have the best blog, videos and photography in the RV and travel universe! Not an easy task. I really enjoy your writing style, content and attitude. So glad you have a Tip Jar so I can buy you a couple beers while a couple thousand miles away. Wow, that is a compliment… are you sure we didn’t slip you a little money to say that? Thanks for the love and so glad to hear you enjoy what we do. Hope to see you out here! We are thinking that might be a very good idea! The name is Denali not dinali. There is no road even to the foot of the mountain let alone up it !! I absolutely love your blog! 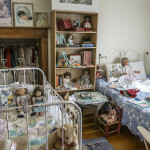 I get a great deal of vicarious pleasure, and lots of great ideas and information for my future RV trips when I retire. Love you two. Thanks. I just saw your video about the rock hitting your windshield. The same thing just happened to us on our way to Yosemite. I called my insurance and they sent Safelite out. I wasn’t sure if they could fix it, because it was about 1.5 to 2 inches in diameter, but they did fix it. You can still see a little something, but its supposed to keep the crack from growing. If they couldn’t fix it, my insurance deductible is $900. Ouch. Oh no! Sorry to hear about the windshield. And the $1 a minute car wash. OUCH! Looks like you guys are having an amazing adventure though. 🙂 Cheers! Sorry to hear even the windshield experts laughed at filling the hole — they should know. But I do wonder what would happen if they tried. Did they say what happens if they try to fill a big hole? Our first rock was within the first 10 months of full-time travel — in your home state of Texas. Darn pick up truck passed us and — Crack!! It’s upsetting! We had it filled in Santa Fe for about $75 (and we were reimbursed by insurance, the best possible scenario). But people our glass service told us a fill is only possible if the ding is smaller than a quarter because of the size of the equipment. If yours is baseball sized…Ouch. 🙁 Will your insurance company cover it? Hope that’s the worst of it and that the tape holds! I am sorry about your windshield getting cracked, it is painful to me the thought of the cost to change it, but hopefully a filling would provisionally work well. On the bright side, you are well! My comment doesn’t have much to do with the RV, but with you guy and girl. I see you are both young, dynamic and eat balanced meals, per your blogs and pictures! In the health care area we know that being continuously in a restrictive position to our body, like driving and/or working, implies a potential hazard to get blood clots, and other potential “gifts” to our bodies, etc. I am curious to know if how RViing affects your health, if it does at all. For all I see, it affects it positively! I do apologize if I am asking a very personal type of question. In the meantime, I enjoy seeing the pictures/videos of your trips and experiences of a lifetime over wheels! If all you did was sit and drive, then yes, that could be bad. However, for most people RVing is a way to get out and see the world. It is our vessel, it gets us to the places we want to experience and that we do. 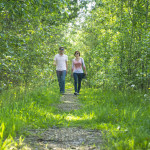 Walking around towns, hiking, paddling…anything outdoors is where we spend as much time as possible. For us, no negatives on health, only positives! Nikki, What you wrote sounds kind of obvious but it is nice to hear it straight from the fairer half of my favorite full timers. I can only dream right now. Drive safely. We traveled to Alaska the summer of 2009, so it’s fun seeing you travel the same roads but with a different perspective! Traveling has so much to offer with each of us taking away something different! Roads were never as bad as everyone said, however the window of opportunity for them to do road construction is small and must take advantage of it. They do have frost heeves…pay attention to the red flags on the side of the road! Don’t try to find “cheaper” fuel, it’s easier to fill up when you get to 1/2 tank. That way you spend more time enjoying your trip than worrying about your fuel gauge. We added a new windshield, 2 new tires and higher fuel prices to our budget before even leaving on our trip. We never did need a new windshield or the tires on our trip to Alaska, but comeback to the lower 48 and BAM…rock in the windshield! Have fun and travel safe!! Ha ha, that sounds about right. You finish up this epic road trip, go home and then get a busted windshield…just when you thought you were in the clear. Thanks for the tips! I just took my first real look at Fleetwood’s 2016 DP lineup tonight. Right away the Wynn influence can be seen in the interior gallery shots of the Excursion. It looks great! SO, SO much better than last year’s gallery pics. We were thinking of closing on a 2015 DP (another brand) motorhome tomorrow. Now I think we shall see what our nearby Fleetwood dealer has to offer us. I’d absolutely consider the Excursion. I love the living area of the 35B but to get it you lose bathroom and bedroom space. I was willing to pay the price for it because I really wanted that living area. Then my wife saw the 2015 Excursion and vetoed the deal. All the things the didn’t care for seem to be gone except for We may check out the Excursion again. I hate the driver and passenger curtains that must have been left over from the Ogaden age of railroad coaches or the roarin’ twenties. There should be at least an option for for the dual MCD type shades tiffin gasser. you know the MCD type shades that are standard in many gas coaches these days. Pat yourselves on the back or buy yourself another round. You are helping us customers to have more and better choices that we may actually like and be proud of. I know that the Excursion is only an entry level DP that lacks a few bells anew whistle but it is really solid and reliable couch for a great price. When I buy a coach, regardless of price, I will enjoy it more if it looks better and I will certainly show more pride in my MH if I think it looks good. Entry-level shouldn’t mean ugly. I will be emailing th people at Fleetwood to express my thoughts. 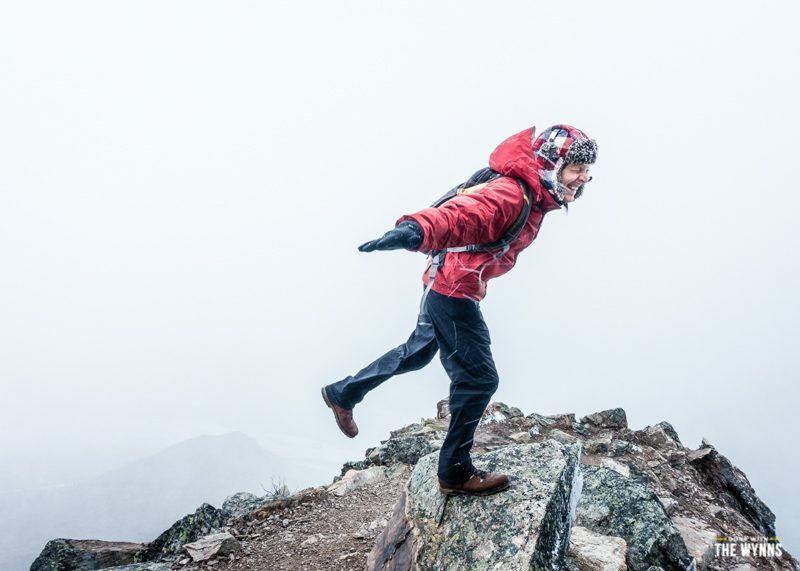 I just got the Magellan’s travel gear catalog in the mail & they a Bugsaway Women’s Hoodie (item # MA5041 for $60) and I thought of Nikki when I saw it (sorry Jason – didn’t see one for guys, but guys are TOUGH, right?). Thought I’d let you know…..
Logging trucks are the worst. The logs have dirt and rocks on them from being cut down and dragged along the ground before being loaded on to the truck, In areas where there is active logging I try and do my days driving after 5pm and thereby avoid the logging trucks. So did you have an opinion / preference of single piece vs split windshield prior to this incident? Thanks for the video updates! Bummer about the windshield. I would definitely try a windshield repair kit on that spot. While it won’t be a true invisible repair it likely will reduce the tendency for the cracks to spread. I sympathize though. I bought a Jeep Wrangler as a Toad a couple of months ago and while driving home from the dealership got dinged from the truck in front of me. Got a repair kit and so far, so good. 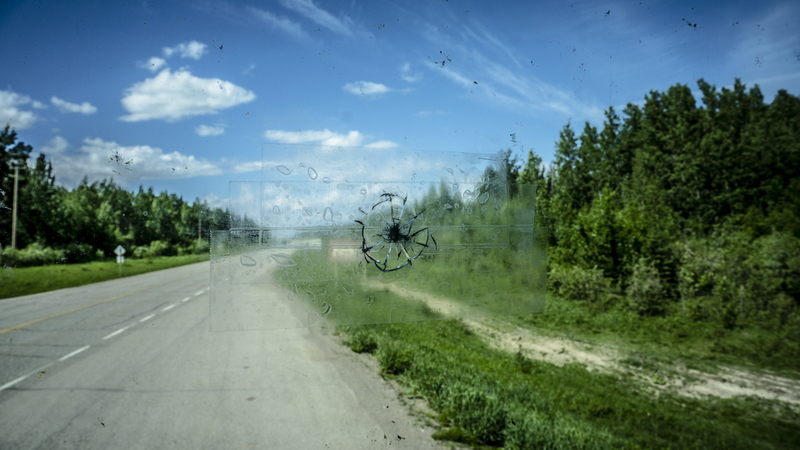 Flat windshields are more vulnerable as rocks hit with very little angle to dissipate energy. We are enjoying keeping up with your Alaska adventure. We will be doing that as soon as my wife can either retire or take an extended vacation. You CAN have that spot on the windshield repaired, no need to replace it. I had one filled on my vehicle years ago and you can not tell where it was. Do your research for the repair. Love your videos. LOL..Jason…you think just like me! One minute sooner one minute later. I think that is what is called fate, and there is no changing it. Remember…it’s just a thing. Like my Brother told me after dinging mine, you have that out of the way now, so don’t worry about it anymore! Great pictures of you and Mrs. W. as always. Do you ever fear dropping everything, including yourselves, into the water on those paddle boards?!?! Haha, Mike Nikki often taunts me when we’re in cold water by shaking the board and laughing…I think she wants me to go down one of these days, lets just hope I’m rolling with the waterproof camera. I’ve driven to/from Alaska 5 times and had the windshield broken every time. It’s almost always the trucks going the other direction that will do you in. Moving to the right will help, and since the roads are so wide this isn’t a problem. They do make windshield glass repair kits and I have had good luck using them. May be something you want to try. At will help keep the glass from getting all spider webs up. Have fun and we love following you. We’ll be heading back up in the next year of two. Thanks Ed, sounds like we’re not the only ones that take home a present from the AK roads. It’s clear, ultra-strog adhesive, 100% waterproof and much thicker than packing tape. This will for sure last all the way back! Wowee, I bet that was an exhilarating drive! I have never experienced temperatures at 25 below and I can’t say its real high on my bucket list…unless its watching polar bears, then I would be willing to endure. A fellow YouTuber (Chris Travels) had the same think happen no more than 50 miles onto the Alcan. Few weeks back. If I recall it was also from a logging truck coming at them. I’ll be coming up next year with a RV trailer and truck. Plan to apply a clear plastic coating over my headlight lens and the front 8″ of hood. It’s supposed to minimize rock chips. I guess the windshield is fair game. Come on truckers, give me your best shot ? Good idea of keeping a roll of clear tape handy. I’m putting together what I call a “crash box”. Just items just in case. Like shackles bolts, assortment of every nut,bolt,washer,cotter pin I own. Having flown to AK. (Fairbanks /North Pole) many times to visit family the roads really are not bad. Even secondary roads that are gravel are better than the inner city ones in Northern Ohio. Safe travels…are you at all the Mile Post or Church’s guides? The best and worst are yet to come! We drove the ALKAN in April. Managed to reach reach Haines Junction before we suffered a chip in the windshield about the size of a quarter. Then we hit the worst section of road – the last 200 miles in Canada before crossing into Alaska. It was so bad, the first thing we did was look into catching a ferry from Whittier to avoid the drive back. Unfortunately, the ferries are fully booked – probably by people who know what the Alcan is like! Some of the roads in Alaska are just as bad – the Parks Hwy, for example. However, when you get here, it’s just amazing! We’ve been here over 7 weeks and it just keeps getting better. If it’ll make you feel any better, we had our windshield broken on the way home from buying are new truck. I could see Jason was emotional in this video and he handled it much more maturely than I did. That was a massive hit and must have been really startling. Watching you outside dealing with the carnage, we totally had that sick feeling in the pit of our stomachs that you were obviously experiencing. We were on I-5 a couple of weeks ago and took a (much smaller) stone into our brand new windshield. We did the same thing… pulled over and covered it with packing tape to keep dirt & moisture out. Being a lot smaller, it was easily filled the next morning (about $60), and shouldn’t spread. We were lucky and are bummed for you. Hope insurance covers it. You should carry a tube of clear glue or sealant with you that you can spread over the rock ding and seal it. On our trip to Alaska we would move to the right a bit as trucks went by. Similarly they would move to the right thus increasing the distance between vehicles. We had no rock damage to the windshield. I enjoy your reports. Safe travels. Yep, I had 2 windshields broken. It’s like slow motion as you see the rock coming at you. I had the extra insurance on the windshield. I had a Monaco that had 2 piece windshields. Let me tell you it ain’t cheap to replace them! If you don’t have the insurance it’s worth it. They also have to ship it to wherever you are going to have it replaced. It’s not like you can call the local glass place and have it done. It took almost a week both times mine had to be replaced. Safe travels. Oh, and hope to hear more about the gasser vs the pusher especially handling (air ride especially and braking. Use caution washing the windshield. If a sunny day, the cold water can cause the crack to get worse. Also, cold night, heated RV, windshield can expand and rather “explode”. Solution, keep it insulated at night on the outside and inside. a quilt or a roll of insulation will do. I used to live in Dawson Creek and elsewhere in B.C..
Great tips, thanks so much for sharing! 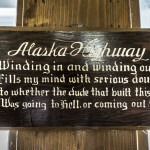 i have lived in Alaska since 1981 & have made 17 round trips to the states & back. Absolutely love the trip . True some towns are more traveler friendly than some & road conditions very from year to year. Hope you have a good time up here it is a great place to connect with nature. 17 round trips!!! Someone should make a special “Alaskan Road Warrior” badge for your car. I bet you have some great stories! Great little intro to the hwy with useful tips on gas and WiFi (yeah! )l total bummer about the windshield, but hopefully that’s the only break you’ll get. Can’t wait to see more of the Alaska adventure. We’re kinda glad we got that chip out of the way. Now if we get another, it will be no big deal! That ladder works better if you start at the bottom when trying to put it away. I have the same one and have faced the same struggle. Once I figured out starting at the bottom to collapse it no more problems. I’m so glad you like it up here, Alberta and BC are two beautiful provinces. 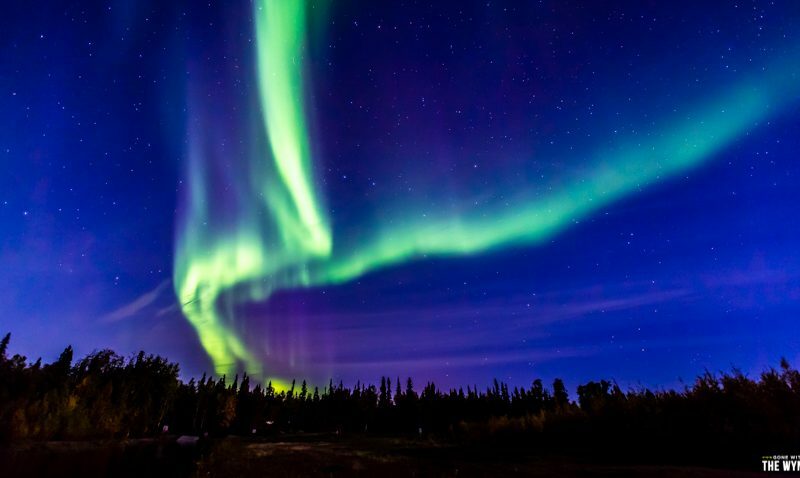 It would nice if you could experience the Northern Lights but they are most spectacular in the fall – but you never know. Sorry to hear about your windshield problem, you can carefully drizzle a few drops of superglue into the crack to keep it from spreading. We made the trip by boat, by air and by truck/pull trailer. we an still remembeer 6,000 miles of black pine trees. Great to follow your adventures. I believe around Haines Junction we started seeing orange cones on side of highway which we quickly learned meant frost heaves. So look out for that. We lost a hub cap and a few screws shook loose and my teeth; but had a wonderful trip. Ha ha, I am sure we have lots of teeth chattering roads ahead!